There’s a reason why your ex is your past—you two just don’t get along anymore. His presence ruins your mood and makes you incredibly upset. Well, dandruff, too, changes your mood for the worse and is very much unwanted! Relatable much? Have you been so annoyed with your ex that you just wanted to rip your hair out because of his behaviour? We’ve been there too! Similarly, dandruff makes you want to rip your hair apart—literally (thanks to all the itching, hair fall and damage)! Ever had an ex who always made you feel crappy about yourself and affected your self-esteem? Dandruff pretty much does the same to you—especially when it gets so bad that you just cannot hide it! The result? A whole lot of embarrassment! It makes you underconfident about yourself and there’s nothing worse than feeling that way. Your ex probably came into your life when you were the most vulnerable and least expected it—much like dandruff! You might be under the impression that your hair and scalp are healthy and happy, until one day when you notice oodles of flakes on your freshly ironed black top/dress! Imagine you’re having fun with your friends at a restaurant and suddenly your ex shows up there? Awkward, right? Well, the same goes with dandruff. You probably won’t even notice it before leaving your house, until it aggravates throughout the day and shows up unexpectedly in your hair, or worse, on the dress that you’re wearing! Embarrassing AF! While you can’t do much about your annoying ex and all the boy drama, you can put an end to the dandruff that’s bothering you. How? The answer lies in the right shampoo! 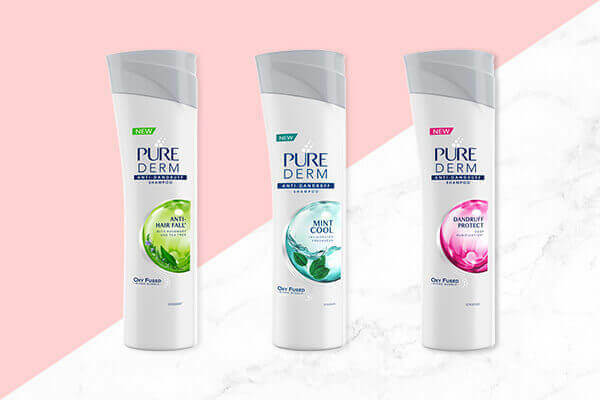 We recommend using the all new Pure Derm — a new anti-dandruff shampoo that comes in three variants: Dandruff Protect, Mint Cool and Anti-Hairfall! They help purify the scalp and bid a forever goodbye to dandruff.